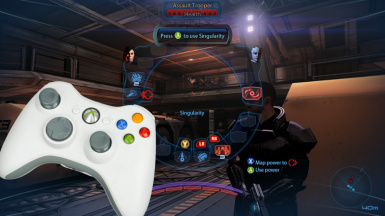 Singleplayer Native Controller Supports swaps the keyboard and mouse controls of Mass Effect 3 for a controller. It switches UIs to their Xbox equivalents and swaps the PC Command HUD with the Xbox Power Wheel. This mod is SINGLEPLAYER ONLY. This provides a native experience far superior to the old hackjobs of XPadder. Your controller should automatically install a driver when plugged into Windows 7 or higher. These controllers work best as they are natively supported. You need to install a driver, as well as an program (Like SCP Server or DS4Windows) and convert your inputs to XInput. You need to have your controller in XInput mode for this to work. Your controller must be able to send inputs as XInput, or Unreal Engine 3 won't recognize them. Multiplayer in the main menu is removed while this mod is installed. This is because Multiplayer does not work with this mod due to the power wheel (unfixable engine bugs). To play Multiplayer with a controller, you uninstall this mod (see Installation Instructions). Then install the Multiplayer Native Controller Support mod. If you attempt to install both mods at the same time, your game will break. Switching is very easy with Mod Manager. The ALOT texture mod is a common addition to this mod. ALOT should be installed after all other mods are installed as it will update installed mod's files with new textures. Installing updates to mods (both mod manager and non-mod manager) will require you to reinstall ALOT. You may consider ignoring updates unless you find a game-breaking one in this mod. 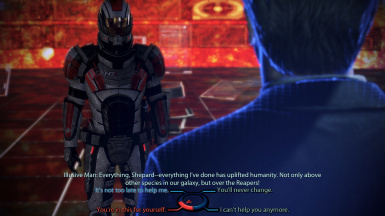 Mass Effect 3 Mod Manager will autoconfigure what files will install when this mod loads in Mod Manager. It should be installed as the final DLC mod because Mod Manager will detect some known incompatibilities. Drag and drop this mod’s 7z download onto Mod Manager to import it into Mod Manager. 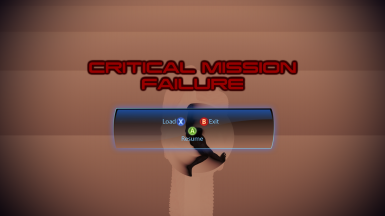 Uninstall this mod by restoring BASEGAME, TESTPATCH, and removing the DLC_CON_XBX Custom DLC. You can do this in the Custom Restore page under the Restore menu in Mod Manager. If you restore your game via Origin, it won't work as it won't remove DLC_CON_XBX from the BIOGame/DLC folder. The mouse will conflict with some menus if it is over things that can be highlighted on the first frame. To fix this you can install an ASI mod that will disable the mouse in the game. Install the ASI Binkw32 bypass from the Tools menu. Then go to Mod Management > ASI Mod Manager, and install Mouse Disabler. To remove this ASI, simply click remove it within the ASI Mod Management window. Click Start Game from within Mod Manager to run the game. Tools > Run AutoTOC on Game in Mod Manager. such as progress bars and counters. but only on interfaces that are controller specific. The Add-On does the rest. This mod is NOT compatible with the BASE Interface Scaling Mod - they both do the same thing. This mod will fully override it, so don't bother. The Add-On mod works with both. There's a difference. WHY DOESN'T IT WORK WITH X:Y ASPECT RATIO? This mod (and the game) is built to support 16:9 screens. I have tried to support other configurations as best I could. The game is not very cooperative, so if you have scaling issues, please only use 16:9 issues. I do not plan to support other aspect ratios because it is an awful lot of difficult work to get scaling to work at all. Designing a good UI that covers all different monitor sizes is actually quite difficult. The game will only read inputs from the first controller. This includes things like flight sticks and other HID devices. Please make sure they are not on or connected when you start the game. This mod is more complex to install than other DLC mods. Do not attempt manual installation. If you still have problems, please follow the directions in the support section below. If you request help from me, you must submit a Mod Manager log. You can generate and upload the log through the Help > Generate Diagnostics Log menu in Mod Manager. 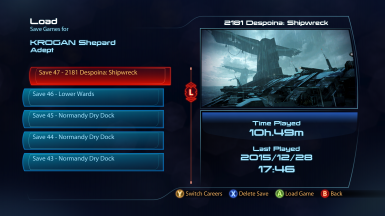 This mod is connected to the ME3Tweaks mod updater service. Mod Manager will notify you of updates to this mod and prompt you to download and update the mod as new updates are released. Install the mod afterwards to use the new update. Please read the Mod Manager mod description as well. If you ask questions that are already answered I'll tell you read it again. I'd like to thank Moonshine for the initial work on this mod several years ago. He provided the Xbox interface file for the power wheel and showed that making UI mods was possible. I'd also like thank Dybuk for providing the original vibration fix, and to you, the users, for supporting my mods. 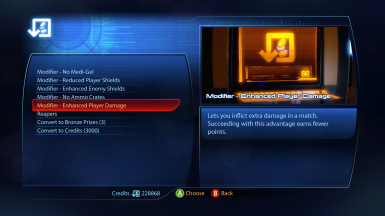 If you'd like to support my work, give this file an endorsement and check out my ME3 modding site ME3Tweaks. You can also donate a Nexus premium subscription as I download a lot of mods when I am testing Mod Manager.